Health workers improve and save lives by providing family planning, maternal and child health, HIV/AIDS, and other essential health care services to communities in need. Country stakeholders recognize the importance of their public health workforce and are striving to ensure health workers’ job satisfaction and safety. They also want to strengthen human resources management so that health workers can reach their greatest potential and fulfill their rights at the workplace. However, health workforce leaders may not be aware of the ways in which unequal opportunities and gender discrimination impede efforts to develop, efficiently deploy, and fairly compensate their health workforces. 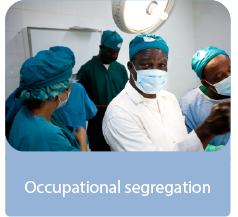 This can result in health worker maldistribution, workplace absenteeism, and a limited pool of motivated health workers, all of which can negatively impact the provision of quality health care. When all health workers, whether male or female, have equal access to opportunities for professional education and skills-building, the production pipeline of new health workers is strengthened. 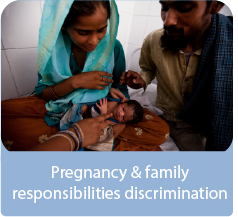 When all health workers, whether male or female, have an equal chance of being employed, fairly paid, and having equal opportunities to advance their careers, and when female health workers are supported through life events such as childbearing, then there may be overall better morale, and greater health workforce productivity. These positive aspects can contribute to increased health worker retention, which means more health workers available to provide more high-quality health services. With improved access to high-quality of health services, health outcomes may improve, and national and international health goals—including ending preventable maternal and child deaths and creating an AIDS-free generation—may be closer to being achieved. Leaders from national ministries of health, finance, labor, and education, as well as from health professional councils, health training institutions, and health facility managers can play a key role addressing gender discrimination. 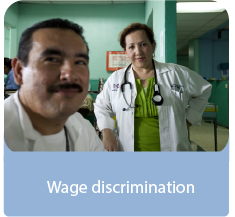 However, they may not know what steps to take to ensure that policies are effectively introduced, financed, implemented, and enforced to promote equal opportunity, nondiscrimination, and gender equality in the health workforce. This tool seeks to guide users on how to develop evidence-based, strategic actions to influence decision-makers and change policies, positions, or programs to show users how advocacy–defined as any action directed to decision-makers to seek at changing these policies, positions, or programs–can help to achieve gender equality in the health workforce. This tool was field-tested in Cross River State, Nigeria, where stakeholders drafted a strategic advocacy plan for gender equality in the health workforce and have formed a Gender Working Group to follow up on these activities.